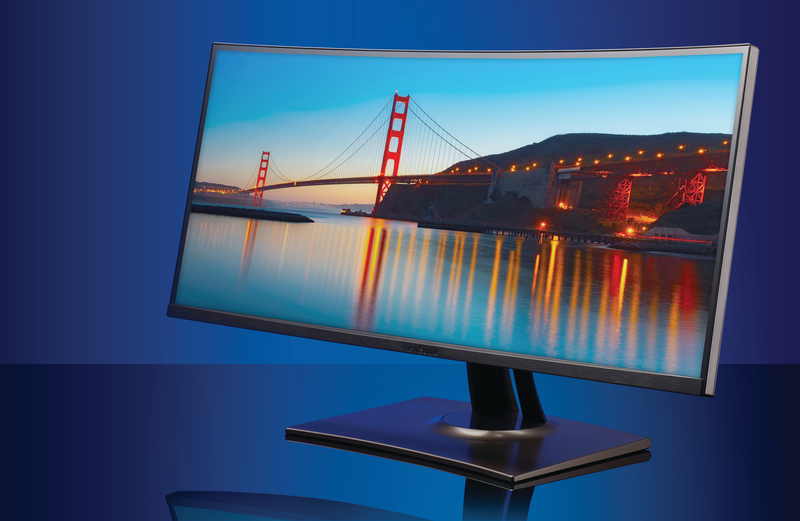 With a 2300R curved screen and stunning WQHD+ 3840×1600 resolution, the ViewSonic VP3881 delivers the most immersive panoramic viewing experience to date. VP3881 is engineered to deliver incredible detail and unmatched colour accuracy across wide viewing angles, while HDR10 content support displays a dynamic range of vivid colours and rich contrast. The extra screen real estate provided by VP3881’s expansive 38” (37.5” viewable) 3-side frameless screen and ultra-wide 21: 9 aspect ratio, along with pre-calibrated IPS colour and integrated speakers make this monitor perfect for video editing and other types of colour-critical content creation. VP3881’s sleek, modern design is future-proof with USB 3.1 Type-C, DisplayPort, and HDMI ports, all of which come with HDCP 2.2 content protection for secure 4K content playback and streaming. VP3881 comes equipped with an amazing Delta E<2 value for precise colour accuracy, integrated colour uniformity for consistent chromaticity across the screen, and a 14-bit 3D look-up table which generates a smooth palette of 4.39 trillion colours. VP3881’s built-in hardware calibration functionality is co-developed with X-Rite which allows you to calibrate the monitor over long-term usage. Co-developed with colour management experts X-rite, VP3881 supports hardware calibration function that aligns graphics card and monitor scalar to ensure lon-term consistency and accurate colour output. *VP3881 hardware calibration function works with X-rite I1 Display Pro and I1 Pro 2 calibrator. With Delta E＜2 colour accuracy, VP3881 delivers stunningly accurate colour reproduction that is nearly indistinguishable from real life colour for consistently brilliant imagery every time. VP3881 covers 100%* of the sRGB colour gamut to produce rich and vibrant colour. Working in the industry standard sRGB colour space ensures that the colour in your projects stays perfectly aligned across devices and on the web. HDR10 High Dynamic Range content brings out the maximum possible detail in both the brighter and darker parts of the image for enhanced colour and contrast ratios and a better overall viewing experience. With a 38” WQHD+ 3840 x 1600 resolution panel, image is displayed with meticulous detail, delivering true-to-life imagery. 21:9 is the standard aspect ratio for cinematic video, meaning that videos can be played and edited in full screen, free from letterboxing. The extra screen real estate provided by VP3881’s ultra-wide panel is ideal for video editing and viewing while a 2300R curved provides immersive viewing experience. ViewSonic’s uniformity correction balances luminance performance on VP3881 with calculated precision, improving delta luminance variance to less than 5% for more consistent brightness across the entire screen and avoids fluctuation in colour temperatures. Enjoy accurate and vivid colours with consistent levels of brightness on VP3881 from any vantage point. SuperClear IPS technology delivers excellent image quality, whether you are looking at VP3881’s screen from above, below, front, or the side. ViewSonic’s exclusive ViewSplit software makes multitasking more effective by efficiently organizing multiple projects into easily manageable segments; a major benefit for users who are used to dual monitor setup by offering extra real estate on a single screen for streamlined project management. Please visit viewsonic.com to download and install ViewSplit software. Industry-leading Keyboard, Video, Mouse (KVM) Switch technology with USB 3.1 Type-C allows user to control peripherals being used alongside VP3881 from a single keyboard and mouse. USB 3.1 Type-C provides Windows and Mac OS system users with user-friendly management of power charging, large-quantity data transmission, and video display. VP3881 comes equipped with Sonic Mode to offer three levels of specialized audio enjoyment, including Standard, Music, and Theater for different applications. VP3881 offers swivel, tilt, and height adjustments for increased comfort and productivity. The client mount feature on the monitor stand allows easy deployment and provides a tidy desktop environment. VP3881 comes equipped with a quick release stand that allows you to attach/detach the panel from the stand tool-free with the push of a button. TUV certified Flicker-Free and Blue Light Filtration technologies help to reduce eye strain over extended viewing periods. USB Type-C, DisplayPort, and HDMI inputs offer more flexibility for connecting VP3881 with other devices. In addition, VP3881 also comes with future-proof HDCP2.2 (High-Bandwidth Digital Content Protection) content protection to prevent digital image and audio resources from being infringed upon or copied and ensuring compatibility with future 4K content. Every VP3881 is individually calibrated and manually adjusted during the production process so that every monitor has the same phenomenal colour performance. The display’s individual colour calibration report is included in the box with the display showing the reading of the screen’s sRGB, EBU, SMPTE-C, REC709, and uniformity with 10 additional readings than a typical colour report to guarantee the exceptional colour performance.